May the Schwartz Be With You: The Schwartz's vs Happy National Running Day! Did y'all know that was a thing? I didn't. Last night my friend Bekah who got me into running almost 3 years ago asked me if I was running today for National Run day. 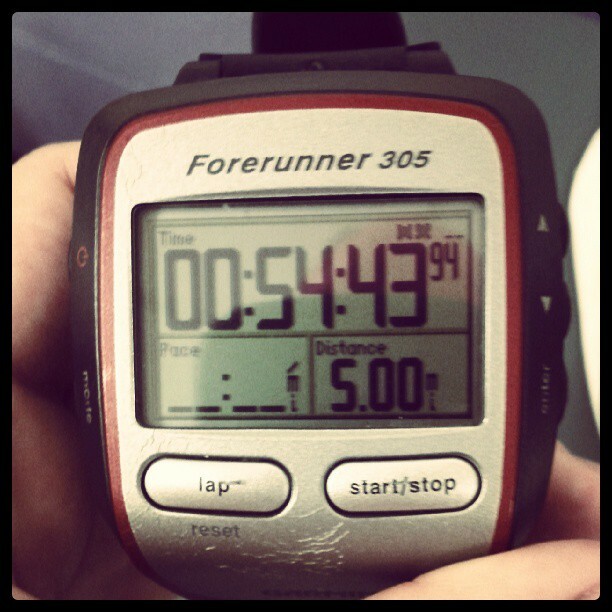 I was planning on running 4 miles today (did 5 miles instead, hollar!) but while I ran I really thought about why I run. I've been asked that before many times. I never really have a good answer. I don't love it. It's not a passion of mine. I'm not good at it. I dream of running 10 minute miles. I fantasize of maybe one day running a 5k in 27 minutes. I think I would die if that ever happened. I usually hang out in the 10:30-11:00 min/mile pace. I wheeze like a fat kid and feel like the funny e card that says, "today while I was running I thought I heard applause and then realized it was just my thighs rubbing together" was written about me. My knees ache and my low back takes the brunt of the pain right now when I run and I am no stranger to shin splints. For the most part I run alone and even with music my negative inner monologue destroys any chance of finding that running nirvana. Most of the time I am my own worst enemy. Sometimes I run for silly reasons. Like the bling. Man I love a good race bling. As much as I hate half marathons I'll probably do more for that big honking medal at the end. Funny, I use to do 5ks just to get a cool t-shirt until I realized longer races give you shiny objects. I run for the community. While I rarely get the pleasure of running with someone else there is a large community of runners. When I meet someone new and I'm trying to find something we have in common to talk about, quite often its running. For runners it doesn't matter if you do ultra endurance races, mud runs, or if you can barely run a mile, if you put one foot in front of the other we'll talk to you about it. I run for those who can't. When I trained for the St. Jude half in 2012 some of those runs were really hard. My negative inner monologue berates the crap out of me most of the time when I'm running. It tells me I can't. It points out every way I will fail. And I often thought about how hard and lonely this was. And then I realized, especially in training for that race, there was a huge hospital full of people, kids, who would give anything to be able to run and here I am complaining about it. I run for them. I run for those who won't. Bekah pointed me in the direction of C25K. But what really made me want to run was watching the Biggest Loser. I don't remember what season it was but they went to these towns and had 3 potential contestants race 1 mile to see who would make it to the ranch. The top 2 from each town got to go. I don't cry often, and I still maintain that I must have been PMSing when I saw this episode, but I bawled. I was so moved and felt so deeply for those people. These morbidly obese people were struggling to even walk a mile at a brisk pace. They were passing out and vomiting. It was horrible. And they were crying because they wanted to make it to the ranch so bad. I really believe that show saves lives and getting through that one mile was their chance to turn their lives around and they just couldn't. They couldn't because they wouldn't for so long. For so long. I run because I don't want to be one of those people. I have terrible eating habits. They are going to catch up with me one day. But I never want to be one of those people who just gives up and won't anymore. Won't get up and get moving. Won't try to be fit and stay healthy. Won't challenge themselves to do better and be stronger. I run for them. I run for my kids. My daughter knows I run. She even knows the difference between my regular gym shoes and my good running shoes. She tells me she wants to run fast like me. I run for her. I run to be like my son who doesn't know how to walk. He runs everywhere he needs to go with a look of pure joy and freedom on his face. I run for him. I run to make my family proud, even if it's only in my head. A lot of the people Chris works with have wives with super powerful and successful positions. I worry when they talk about the cool things their wives do, Chris has nothing to say about me. I run so he has something he hopefully feels he can brag about. And while I know my parents don't actually care if I run or not, it makes me feel really good that they are so supportive of my running. They drove 3 hours to see me finish my first half marathon. That makes me happy. I run to make them all proud. But most of all I run because it's hard. I run because it's not easy and I have to push myself every step, every mile, every time. I run to stretch myself and to set and accomplish goals. I run because now that I stay home there aren't very many ways for me to judge if I've done a good job at something. There's no applications to look through and people to interview; there's no loan goals to hit; there's not even a Gateway Exam to push my students to excel at. Running gives me a way to challenge myself and see if I've made the grade. I run to remind myself of Philippians 4:13. And I run because I hate it and every fiber in my being says quit and I am not a quitter. So I run. I may be slow, but at least I go. Happy National Running Day! I also decided to run to just take better care of my body. I've always been small but pretty much was woefully out of shape and couldn't even run half a mile without getting winded. So I decided to at least start getting in shape and generally try and take better care of myself. That is awesome Madeline! I've never run barefoot I'm too much of a sissy but I know a ton of people who swear by those Vibrim shoes. Supposedly it gives you a more natural stride and strike. But who knows. I think it's great that you didn't let forgetting to pack your shoes hold you back. I know how you feel about running to just take better care. When I started running I felt like I was relatively in shape. I worked out 5 days a week. But when I first started C25K those intervals were challenging. Good luck on your first half marathon! Watch out! Race bling is addictive! Which race are you doing? I'll be doing the Marine Corps Marathon in downtown Jacksonville. A friend of mine did it last year and enjoyed it. The race course goes over a couple of bridges on the St. Johns River so at least it will be some nice scenery. I'm in love with every word in this post. I LOVE this post! You open up and let the real you peek through and it's great to see that. You're writing just flows and it sounds genuine. As for the running, I am in awe of how quickly you've become a real runner and even more in awe of your dedication. I've had given up long ago ( in fact I did!). You should be very proud of yourself! And although it doesn't matter what anyone else thinks - I know your husband, family and friends are VERY proud of you! I quit running for three months when I found out we were moving. March to May. Your triathlon post motivated me to buck up and get back out the door. Lovely post. You're an inspiration.